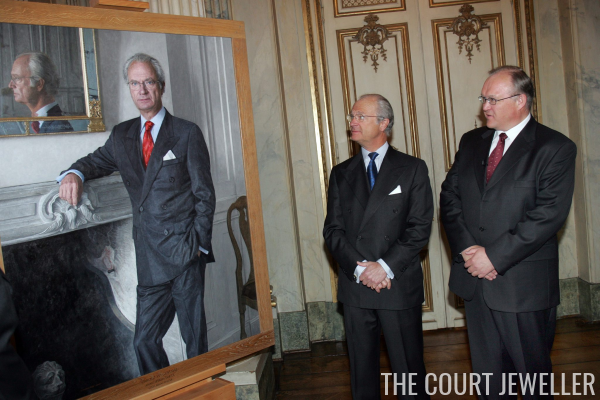 This week, King Carl XVI Gustaf will celebrate his 70th birthday at a gathering of Europe's royals in Stockholm. To prep for Saturday's festivities -- which will be black tie, so don't expect tiaras -- we're looking back ten years to the king's 60th birthday, which was marked with three events in 2006. Today, we're rewinding to the private dinner held the night before the king's birthday. The Swedish royals were waiting inside Drottningholm Palace for their guests to arrive, so we don't have pictures of them from the private dinner. However, earlier in the day the king did appear in front of the cameras to accept his birthday gift from the Swedish people: a rather business-y portrait. 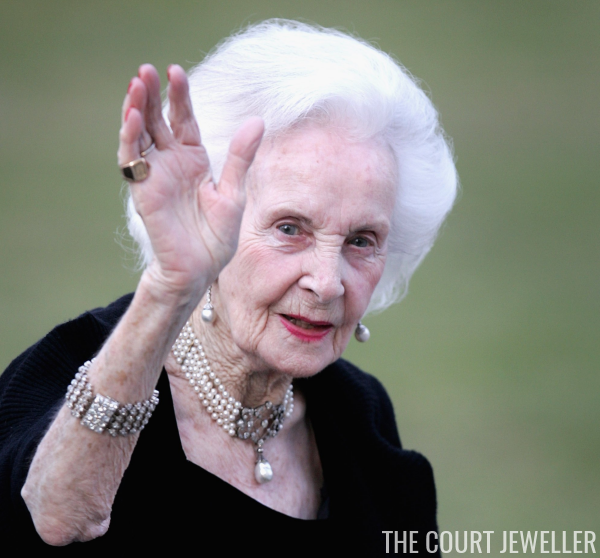 Princess Lilian of Sweden was in the arrivals queue, wearing diamond and pearl jewelry that was a perfect complement to her lovely white hair. A couple of pieces here are of note. The diamond bracelet, with its zig-zag pattern, has been worn frequently in recent years by Victoria and Madeleine, who wore it on her wedding day. The pearl and diamond choker was one of her favorite pieces; she often wore it with other pendants in place of the pearl, including a large aquamarine. Also present (and dapper), but not yet royal: Daniel Westling, who would become Prince Daniel of Sweden when he married Crown Princess Victoria four years later. The two had already been dating for some time at this point. 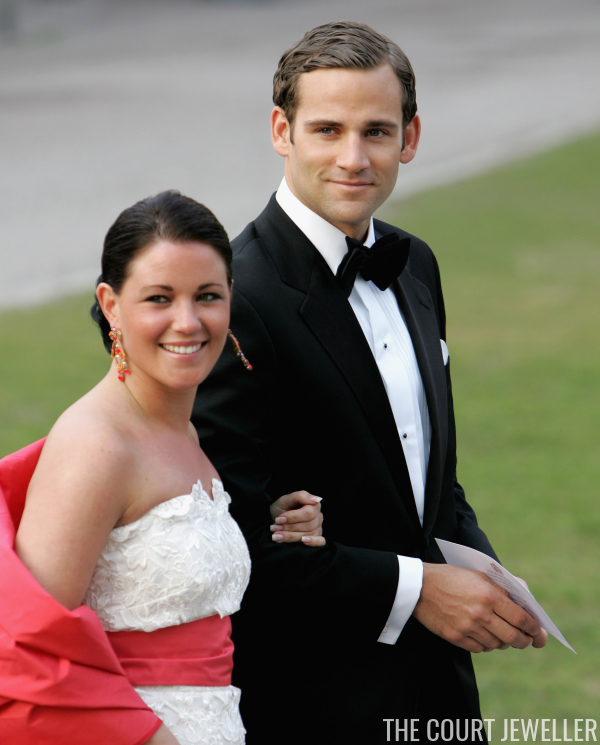 And, to give you an idea of just how very much things have changed in ten years, here are the 2006-era partners of the king's other children: Jonas Bergström, then-boyfriend (and later fiancé) of Princess Madeleine, and Emma Pernald, then-girlfriend of Prince Carl Philip. Love your colorful earrings, Emma! The Danish royals were represented by Crown Princess Mary, who wore her diamond and amethyst drop earrings, and Prince Henrik. 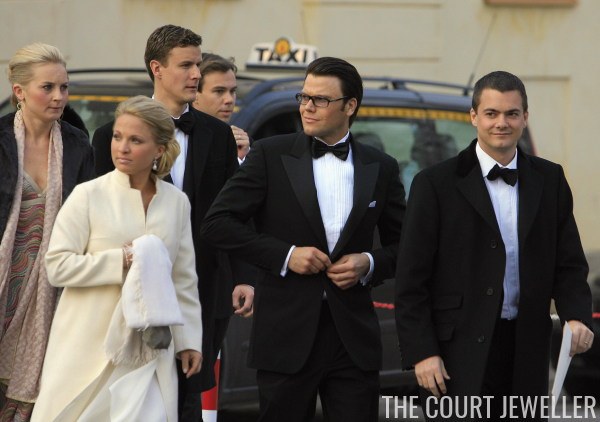 The extended Danish/Greek royals were in attendance as well. Anne-Marie of Greece (who is the king's first cousin) wore a couple of pieces with royal provenance. 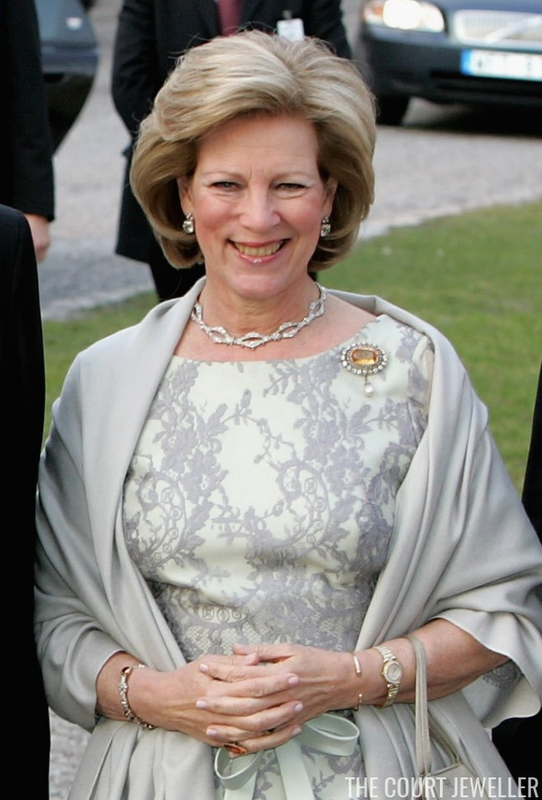 Take note of the diamond necklace, which is part of a sautoir that once belonged to Queen Alexandrine of Denmark. 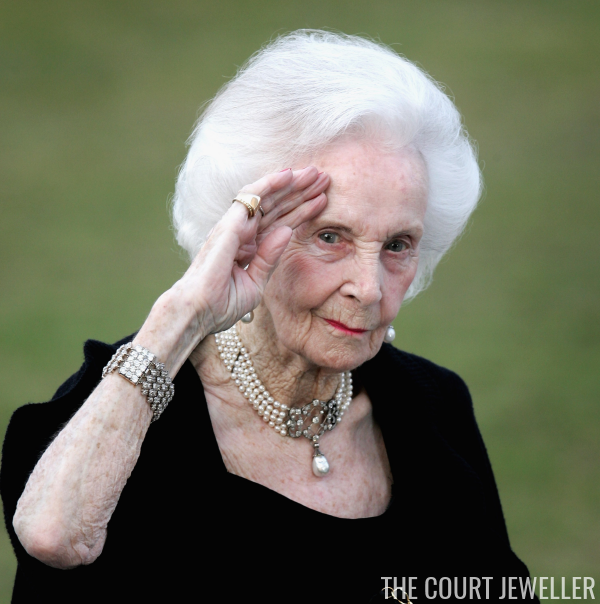 The topaz, diamond, and pearl brooch was bequeathed to her by her mother, Queen Ingrid of Denmark. You also get a good look here at her simple gold bracelet, traditionally worn by the descendants of Margaret of Connaught. Anne-Marie's daughter-in-law, Marie Chantal, wore her diamond JAR earrings with a glittering bracelet. Three Norwegian royal ladies were in attendance at the dinner. 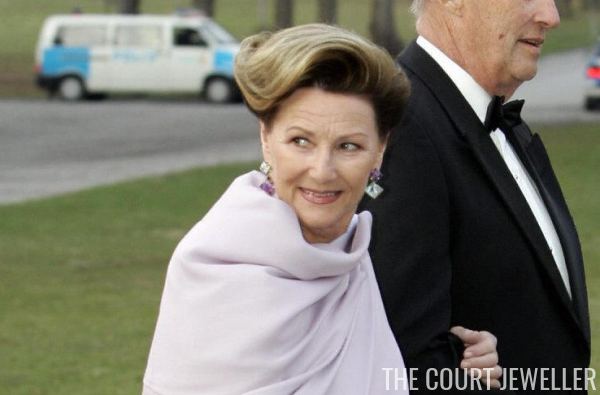 Queen Sonja wore her modern amethyst and aquamarine earrings. Both earrings feature the two stones, but each earring alternates the order of the gems. Crown Princess Mette-Marit wore a pair of dangling gold earrings set with four gemstones. It's not shown here, but she also wore a cocktail ring with an orange stone. 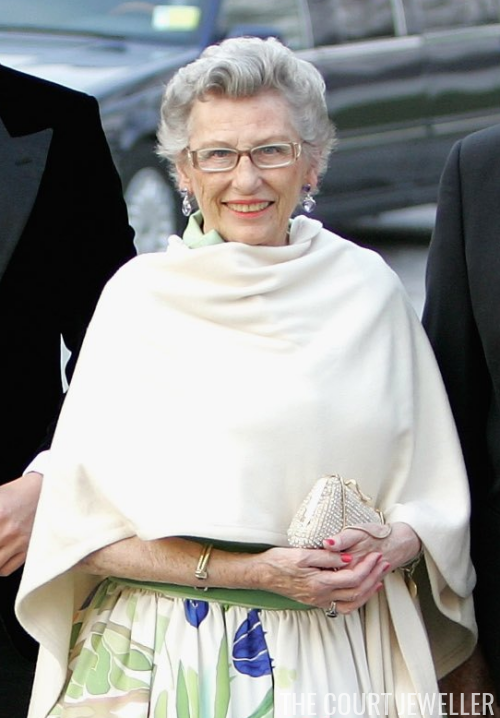 One of my favorite royals, Princess Astrid, wore a fun pair of gem-set earrings and a golden cuff bracelet. I think I also see a gold charm bracelet peeking out from under her wrap. Princess (now Queen) Maxima of the Netherlands borrowed pieces of turquoise and diamond jewelry from her mother-in-law, Beatrix, for the occasion. The brooch, the earrings, and the station necklace/pendant are all set with diamonds and Persian turquoises. Queen Sofia of Spain selected diamonds and pearls for the evening, including a pair of diamond earrings with pearl drops. Several members of the extended Jordanian royal family were also in attendance at the dinner. 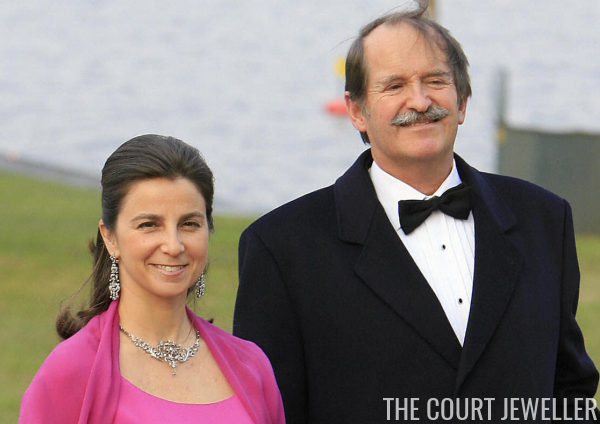 Princess Sarvath, the forever-youthful wife of Prince Hassan, wore a pair of diamond and ruby earrings. Princess Rym, wife of Prince Ali, wore an intriguing pair of dangling earrings. The beads at the base of each earring almost look like cotton pearls. A few more ladies from former reigning royal houses were also in attendance. Rosario of Bulgaria, who is usually extremely minimalist when it comes to jewelry, wore a couple of bracelets. Considerably more exciting: the diamond demi-parure worn by the Duchess of Braganza. The set includes an ornate necklace and matching earrings. Not sure about the provenance of this suite, but it's gorgeous!